A sparkling round cut diamond glows from the face of this antique engagement ring. 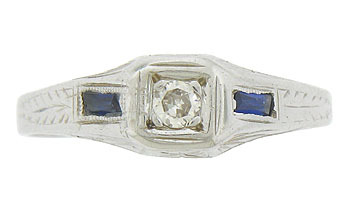 A pair of sapphire baguettes are set into the rings shoulders. 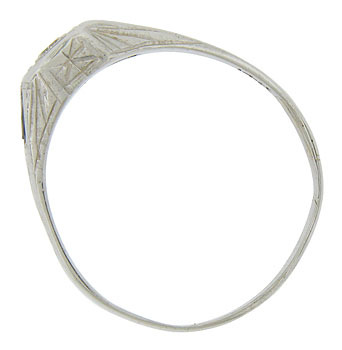 Abstract organic engraving covers the rings shoulders and sides. 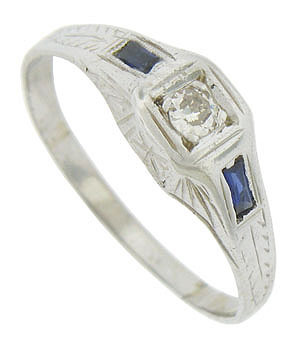 This Art Deco ring is fashioned of 14K white gold and measures 5.73 mm in width. Circa: 1920. Size 6 1/2. We can re-size.